ADHD ( attentionin short is a combination of inattention (disorganization) combined with hyperactivity (impulsivity). Persons who suffer from ADHD struggle to control their focus of attention and have decreased ability to resist distractions. They have trouble with foresight and hindsight and have an increased need for immediate feedback and reward. When it comes to paying attention: ADHD doesn’t mean you can’t pay attention at all, it means you can’t pay attention to anything except what is the most interesting stimulus available. A person with ADHD therefore cannot resist focusing on the most interesting thing, in order to turn their attention to the most important thing. It can be compared to a moth dancing around a flame, until a brighter light comes along. 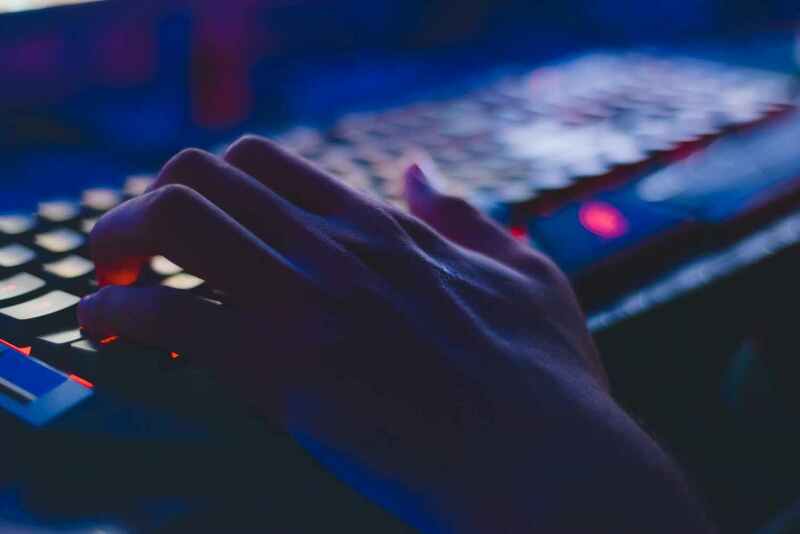 How does a person with ADHD fall prey to excessive online game use or abuse? Online games display bright light and a lot of movement, quite the opposite of a book about mathematics. The human brain has evolutionary evolved to pay attention to movement. Online games are naturally attractive and therefore doesn’t require forced attention. Games are also constantly changing and keep the player totally engaged, because of the shifting activities. The games provide immediate feedback and immediate reactions. It helps to release loads of dopamine in the pleasure centre of your brain, which keeps you feeling really good. Online games don’t require writing, which is a problem for those with ADHD. Gaming is a social activity where people with ADHD feel more accepted then in the real world. 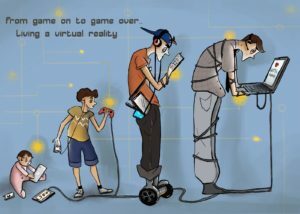 All of the above lead to excessive use of media and gaming, which leads to poor functioning in the real world. People with ADHD has as high as a 25% risk of developing an Internet Addiction compared to persons without ADHD. 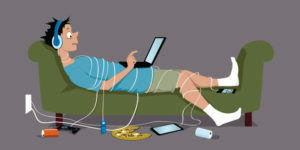 Other conditions that also increase the risk of becoming addicted to the internet are depression, social phobia, hostility and the presence of other addictions. Gaming reinforces the kind of behaviors that we would like to eliminate in children with ADHD. Some of these are their quick and impulsive responses, acting before thinking, lack of patience,need for immediate reward, and the need for constantly changing stimuli. Even worse is the time they spent on gaming could have been spend learning skills like impulse control. Parents should realize that the ADHD child doesn’t do better than their peer at gaming, it’s that they do better at gaming than they do on their other activities. Watch you own habits: Make sure to check your own cell phone habits before you create a technology use plan with your child or teen. Designating no-phone spaces in the house (i.e. kitchen or living room) or times (i.e. mealtimes or bedtimes) can improve family relationships and help everyone feel more in control of their cell phone use. Create alternative activities: Less phone use won’t feel like a punishment if kids and teens have flexible, fun options when it comes to their attention. What activities does your child enjoy that don’t involve screens, and how can they be utilized when your child seems particularly dependent on their phone? A day at the park, a museum, or the pool can prove a much-needed break in hyper-focus. 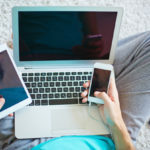 Assist them to develop healthy digital habits: As they progress in their education and eventually their career, your child will rely increasingly on mobile devices and other technology. Abstinence from phone use is not the goal, because it’s not sustainable for the future. If your child can start to use their cell phone thoughtfully and monitor their use, then it will only benefit them as they move forward in life. Ask for Help: Never hesitate to ask for yourself if setting limits and negotiating use doesn’t seem to work. Mental health professionals can provide cognitive and behavioral interventions tailored to treat dependence and can help your child learn alternative ways of coping and directing their attention. They can also help families negotiate rules that benefit everyone and provide a break from being glued to cell phones. If you’re not sure where to start, have an open and honest conversation with your child or teen about their cell phone use. What do they like about mobile technology? What makes them happy that doesn’t require a cell phone? Finding balance with technology use can be difficult, even for adults. So practice patience with your child, and consider how you can help them develop a thoughtful and healthy relationship with their mobile device. 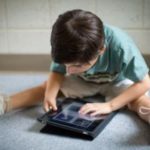 If you are in doubt whether limiting or restricting your child’s access to technology, will negatively impact their development, you should read the next article. The question is why would the world’s top digital developers (guys from Yahoo, Google, Hewlett Packard, Facebook) send their kids to schools where technology is only introduced sparingly from the age of 13? What do they know about the products they develop and its effects on the human brain that we don’t?